"I think it starts with the ingredients, and that you're using all natural, fresh ingredients," says Gina Garcia. 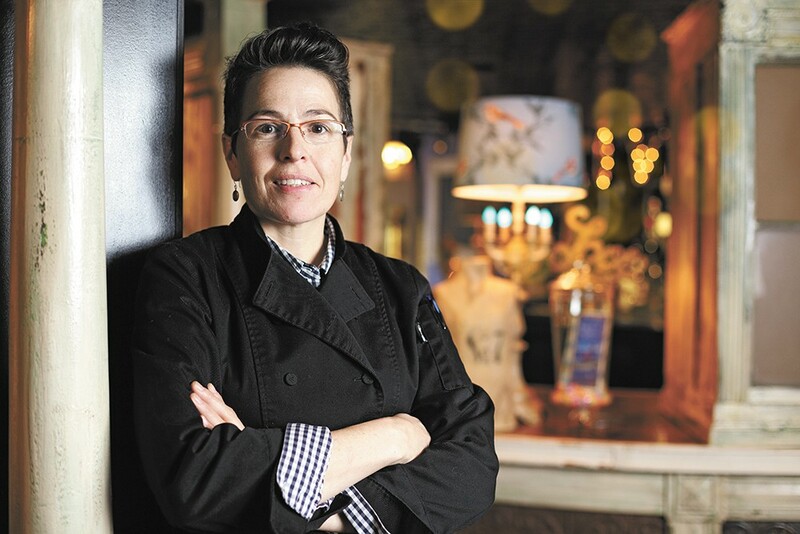 Before Gina Garcia was Chaps' pastry chef, she ran her own bakery. She opened Take the Cake in downtown Spokane and later expanded it and relocated to the South Hill to sell a combination of cakes and savory treats. When Chaps owner Celeste Shaw approached her about embarking on a new bakery project, the two joined forces and made Chaps Diner and Bakery what it is today. INLANDER: How long have you been baking? GARCIA: It'll probably be 20 years this summer, actually. What first got you into it? Well, I come from a family of foodies. My grandfather owned a deli and he also had a restaurant. So I was around that growing up. I always loved food but I never thought of it as something I could pursue as a career. So I went to art school instead, and eventually decided I'd take a go at culinary school. I immediately loved it. And then I wanted to own my own bakery. So I just got really fortunate, and I was able to do that just about a year out of culinary school. What would you say are some of your favorite pastries to make? I would say that I love to make pie. That's my all-time favorite thing to make. You can tailor it to the season. In summer you have all kinds of fruits that you can work with, and it's nice because I can purchase local fruits, which I like to do. And right now I'm teaching myself how to make bread. So that's kind of my new adventure. It's a completely different animal from pastry and cakes. It's a lot of fun. It's nice to be able to have that flexibility to do new things, especially when you're in this business for such a long time. It keeps it exciting. What would you say makes a really great pastry? I think it starts with the ingredients, and that you're using all natural, fresh ingredients. We try to source local when we can. We don't use any shortenings or hydrogenated oils or anything. And, you know, we keep it fresh. So usually you'll get something right out of the oven or, depending on how the production of dough lays out, you'll get something that was just made up a few hours before. I think that makes a lot of difference as well. So you did the first Restaurant Week last year. What was the experience like? I think we were really well received by it. We had a lot of new people come and try us out, which was, you know, kind of the intent of it — to get that kind of exposure. It also gave us the opportunity to feature some of our signature items that we do. We really look forward to doing it again this year. What are some of the items you'll be featuring this year? We're going to do a maple glaze salmon, and we'll also be doing our flat iron steak. And then as far as desserts go, we have a peppermint chocolate mousse that is really popular this time of year. It's really light and refreshing. And we're also going to serve a Brain Freeze [Creamery] salted caramel ice cream with espresso — a shot of espresso poured over the top of it. Sat., April 20, 10 a.m.-12 p.m.